Nielsen released its “2017 Year-End Music Report” for the US, which contains a bevy of statistics on music consumption, live music, and chart-topping tracks and albums. Total recorded music consumption was up by 12.5% in 2017 over 2016, per the report. Total consumption is measured as the combination of album sales, track equivalent album (TEA) sales, and on-demand audio/video streaming equivalent albums (SEAs). TEAs refer to the sale of music downloads or singles (a TEA is equal to 10 tracks), while SEAs account for streaming services, with 1,500 SEAs equal to one album. Streaming was the driver of increased music consumption again last year as in 2016, representing 54% of consumption in 2017. The number on-demand audio and video music streams grew by 43% to 618 billion, per the report. 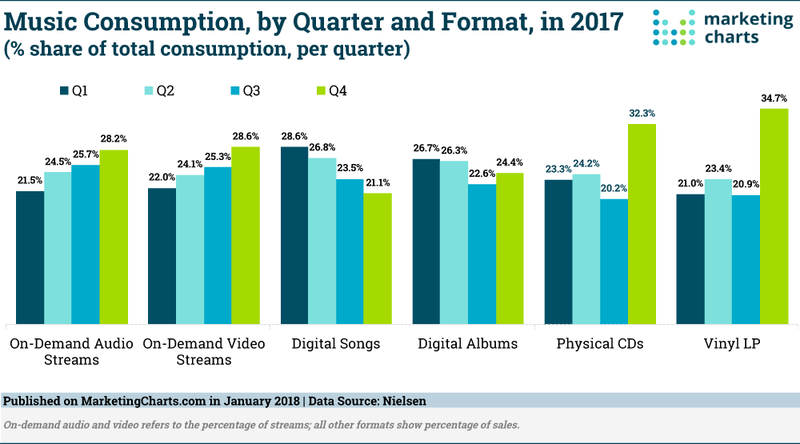 On-demand audio streams grew by almost three-times the rate (+58.7%) of on-demand video streams (+20.9%), and accounted for almost twice the number of streams (400.4 billion vs. 217.7 billion). Read the rest at MarketingCharts.